The General Board of Pension and Health Benefits of The United Methodist Church (GBPHB), and its Wespath investment management division, today announced the implementation of two new investment guidelines. These guidelines provide direction for identifying and managing the excessive sustainability risk that could potentially affect the value of assets held on behalf of benefit plans and institutional investment clients. One guideline relates to climate change (focused on the thermal coal sector); the other relates to human rights (focused on companies operating in some of the most challenging countries and conflict-affected regions in the world). Investors increasingly recognize that certain environmental, social and governance (ESG) issues (climate change and human rights among them) can present an excessive degree of sustainability risk to the prudent management of investment funds. Ensuring sustainability—in terms of financial performance and with consideration for the importance of ESG factors—is integral to GBPHB’s investment philosophy. As a long-term investor in nearly 5,000 companies, GBPHB’s active ownership strategy focuses on identifying and engaging companies whose securities present a fiduciary risk to plan participants and institutional investors, due to the companies’ unsustainable business practices. GBPHB believes that constructive engagement on ESG issues—taking advantage of its privileged position as a significant global investor—is the most powerful tool for effecting corporate change. 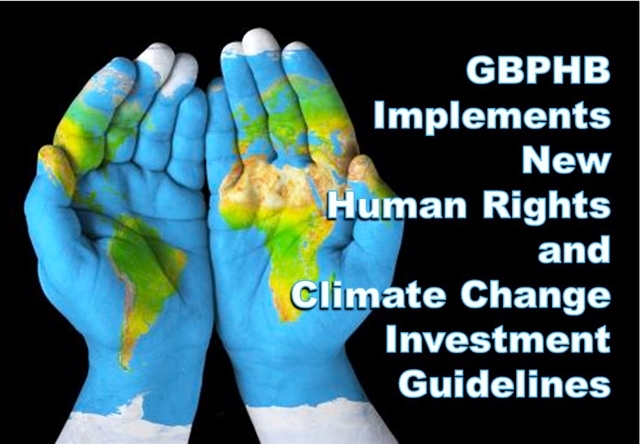 Details on GBPHB’s sustainable investment strategies and the implementation of the guidelines for climate change (thermal coal) and Human Rights can be found at gbophb.org/climatechange and gbophb.org/humanrights. Click here to read UM Communications article on this announcement. Please direct questions to GBPHB at guidelines@gbophb.org.